Preston North End midfielder Ben Pringle has joined Tranmere Rovers on loan for the rest of the season after his spell at Grimsby was cut short. His stint with the Mariners was due to last until the end of the campaign but after 18 appearances he has now joined another League Two side. After PNE and Grimsby agreed to cancel his spell at Blundell Park, the 29-year-old could make his Rovers debut against Mansfield on Saturday. “I am really pleased we have signed Ben until the end of the season, he is someone we have been watching for a while,” said Tranmere boss Micky Mellon. “He is an attacking player, left footed and can play in the wide areas. 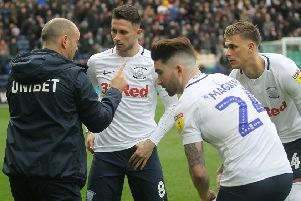 Pringle's PNE contract expires in the summer, the former Rotherham and Fulham man having been out of favour for the majority of his time at Deepdale. His last competitive appearance for the Lilywhites came in the 1-1 draw at Nottingham Forest in December 2016. In total he has made just 14 appearances for PNE, four of those coming in the League Cup. Pringle also spent the second-half of last season on loan at Oldham.